Surely, the barrel-like marker for the southernmost point of the continental United States -- ``90 Miles to Cuba'' -- would be more specific if the reference point on the other side of the Florida Straits were Havana. But the closest Cuban city to the Florida peninsula is Matanzas, and despite its storied history, cultural pedigree and host of unheralded charms, this Rodney Dangerfield of a place gets no respect. Stuck in the shadow of the neighboring capital, breezy Matanzas, a mid-point for tourists on the way to world-famous Varadero beach, more often than not is overlooked. 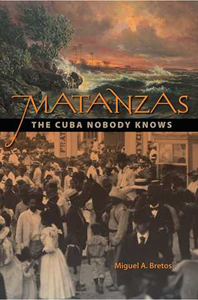 But historian Miguel A. Bretos -- a native matancero, former professor at Florida International University and retired Smithsonian scholar -- remedies the neglect in his insightful Matanzas: The Cuba Nobody Knows. Exiled at 18 in 1961, Bretos writes from a unique mix of memory, personal and family experience and meticulous research that begins with the native Taínos and colonial times. He ends the account at the triumph of the Cuban Revolution in 1959 but wisely includes observations and experiences from a return trip to the island in 2003. His research took him to key archives in Seville, Spain, and Washington, D.C., to the University of Matanzas and the University of Miami's Cuban Heritage Collection. Equally important to the flow of a narrative heavy with historical data is Bretos' well-pointed wit. He populates his story with family characters such as Tía Niquita, renowned for her quilts, and an uncle who settled in Omaha and raised offspring who are now bona fide deer-hunting Americans. One of the book's most fascinating chapters chronicles the key role matanceros played in the development of Cuban music. Matanzas (literally ``slaughters'') is the birthplace of the traditional romantic danzón -- once the official national dance -- and the sensual rhythmic guaguancó, a product of the city's preeminence as a hub of Afro-Cuban culture. The city also was home to the country's first building wired for electricity, the first electric street cars and Cuba's first public library. No wonder Matanzas was nicknamed ``the Athens of Cuba'' after a spirited debate among 19th century city leaders who also considered ``the Venice of Cuba'' (some argued that the San Juan River's course through the city reminded them of the Grand Canal), ``the Naples of the Americas'' (someone else thought the city looked like Naples) and ``the Tyre of the Western Seas'' (because Matanzas was shaping up to be a flourishing commercial center). Bretos believes that the Athens inspiration may have come to Matanzas via its connection to Boston, which had been called ``the American Athens'' for decades. Matanceros engaged in heavy commercial trading with Bostonians, exporting sugar and importing hard granite cobblestones to pave the streets.